So, presumably M&M can restore an elite armor unit back to 4 tank figures, rather than 3. But there are some scenarios where a side has both types of armor, and there is no way to distinguish them once losses happen. Do you just use the elite figure counter anyway if the armor gets jumbled up? EDIT: I guess this is pretty simple, I've just noticed people seem to not use the elite figure marker for armor at the start since they get no special benefit throughout the game and just add the extra tank. Maybe they forget that there is an ongoing difference between them because of M&M? Or it's just rare to not be able to remember which group was which? That's why you use the Elite marker, so they don't get mixed up. There are a few scenarios where all units of a type are elite, and in those scenarios it is stated that you don't have to use the counters, otherwise you should use the counters, simply because of M&M. 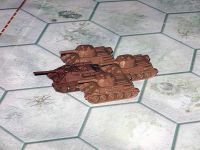 I use a different tank miniature as the 4th tank to mark elite units. That works too if you have them (though arguably a KV-1 or JS-2 would be more in line with what the elite tank units generally represent). What type of mini is that/where did you get that?